St Pauls Cathedral is one of London's most recognisable buildings and is the masterpiece of Sir Christopher Wren. The Cathedral was completed in 1 1710 after the previous building was destroyed by the Great Fire of 1666. 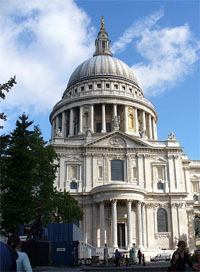 St Paul's Cathedral stands tall with the largest church dome in the Uk and has been through a lot in the past 300 years. Where is the Cathedral? St Pauls Church Yard, EC4. 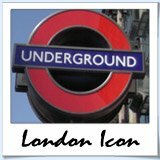 The closest tube stop is St Pauls. Tickets: Prices range from £4 for children to £9.50 for Adults. Last entry is 4:00pm Mon - Sat. Checkout the St Pauls Cathedral website for more details. 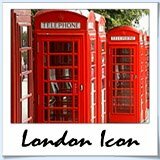 Many famous funerals (Lord Nelson and Winston Churchill to name a couple) and weddings (who could forget Princess Diana and Prince Charles?) have taken place at the Cathedral. For Londoners, the huge dome is a symbol of pride and perseverance having survived the Blitz untouched. The Cathedral has recently undergone complete restoration works and now stands prouder than ever and the inside is a spectable to behold. Most people that visit St Pauls are interested in climbing to the top of the dome and rightly so. The view from the top is spectacular and just for the record, there's actually 3 domes. 530 Stairs will take you to the top and not only will you be treated to a view of the city, but the alfresco paintings and vantage point to admire the interior are simply stunning. On the way up - after precisely 259 steps - you'll reach the interior walkway of the dome's base, aptly named the Whispering Gallery because if you talk close to the wall you'll be heard 32m away on the other side of the dome. Once you have finished admiring the view and the spectacular interior of the Cathedral you can roam the church yard and take in the icredible details of the building. If chathedrals and/ or architecture are your thing, give yourself a good couple of ours to take it all in.